I'm so excited to kick off 2017 with a new, great, big business step forward! I'm going to launch a wedding product line! I can't give away the details just yeeeeet, but I've been conducting research, bouncing ideas off of my friends and family, and starting to gather items to be used for said products. Now that wedding season is officially over, and engagement season has begun, I have the time to re-brand myself a little bit in anticipation of this product line. Sheesh! Who knew that there was so much that went into making and selling stuff? In other news, now that my December wedding is officially over (pictures coming as soon as the photographer releases them!) I am free to focus on the six other weddings I am in the midst of planning and coordinating. It's a lot of computer research, paperwork, and emails, which I really enjoy. I love the freedom of not having to pass my communication with clients and vendors by anyone else--such as a boss. It's just me! How crazy awesome it is to be able to call the shots. It saves so much time and keeps things organized, as information goes through less hands this way. I am also excited that as I work with more vendors, I am beginning to pull together a cohesive Preferred Vendors List, especially because it means there's a possibility of working with my favorite vendors more than once. I really love strengthening my relationships with great vendors, because it makes working with them during weddings organized, predictable, and enjoyable. As a wedding planner, I sometimes feel as though other vendors worry I'm just there to tell them how to do their jobs. On the contrary, I don't want to have to do that--I have my own job to get done. Instead, I want to work with vendors who know how to do their jobs better than I even understand. Rather than worry they'll do it wrong, it's my dream (I'm serious, my DREAM!) 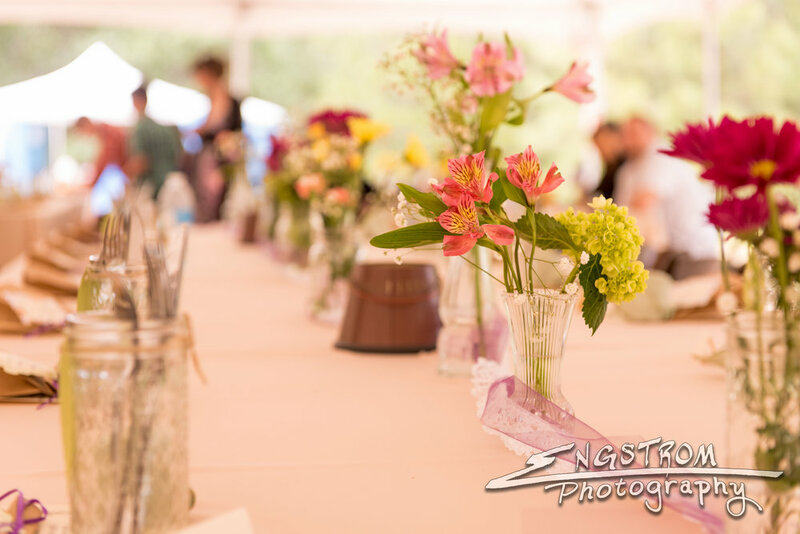 to work with a group of vendors who can seamlessly work together to pull off a beautiful wedding. December is almost over! Uh, when did that happen? As this year inches near it's closing, I feel proud of what this business has accomplished in the seven months it's been around, and look forward to what 2017 will bring. Here's to growth in personal knowledge and experience, and to the happiness and success of all my clients' marriages. Before I started my business I felt that there was a large distinction between small businesses and large businesses. Trying to unpack why this is the case has been a very complex process for me for many reasons, but one of note is that when I was in the single digits of my life, my family started a business creating and selling beeswax candles, lip balm, and other natural products at farmers markets, boutiques, and online. My brothers and I learned from our parents the entire creation process of these products, along with the hustle of packaging and marketing. To me, we were a small business. I understood the importance of turning a profit, because the products we sold had initial costs and took time to put together, but I also knew that we weren't making much money based on the amount we sold each week. We eventually stopped producing and selling these products and closed our business; it was an invaluable experience for me, and I've since gone on to start multiple small businesses myself, but that initial experience gave me the impression that unless a business is huge, it is incapable of turning a sustainable profit. That is, one to live on. At least, this was my opinion of businesses that sold products. Maybe this explains why I've gravitated forward the service industry instead of the product industry, since it becomes a matter of selling time and effort rather than a product that is the result of time and effort. For whatever reason, people will spend a lot more money paying for time and effort than they will for a product, which--I imagine--is partly because a product is only as valuable to its buyer as its benefits are. To its producers, however, it's price tag pays for the wage of workers, the cost of the product's parts, the costs of marketing and business, and a little extra to make it all worthwhile for the business owner. Two very different perspectives on the item's cost that will only sell sustainably if both seller and buyer consider the same cost to be reasonable. Maybe it's not so different as I make it out to be, though. In many ways, being in the business of selling my services, I am the product people are buying. The stakes are higher this way, since unsatisfied customers will be directly unsatisfied with me; however, it connects the value of my clients' money to a person, and it forces them to understand that business is...well, personal. I am a person. The effort that I make has human constraint, and is limited by the fact that--as a person--I have a personal life in addition to my business. Being a small business owner, I am not branded enough that--like Target, or Krispy Kreme, or Clark Pest Control--when you think about me, you imagine a business made up of effective products, professional phone answering services, or locations characterized by standard logo colors and lit up text above the doors. The reality of my business is that it's just me. I work on my computer. I designed and run my website myself. I take my Instagram pictures, choose the filters, and think of my own captions and hashtags. I answer all of my business phone calls, texts, and emails; I pay for the gasoline that it costs my car to meet with my clients, and I write it off as a business expense on my taxes. I do my work at my desk when I'm home, on my phone when I'm out, or on site with clients, and I do it simultaneously with my private everyday life. Amidst all of this meshing of business and personal life I have felt that I struggled to keep my personal and professional lives in separate boxes. Sure, I lived in the same place that I worked, but if other brands could keep things clear of any evidence that it was run by imperfect people, why couldn't I? And that's the punchline, everybody. Every business is run by imperfect people. Nothing about it is actually mechanical--the Trader Joe's that my boyfriend used to work at is always stocked with well-organized, priced, and labeled food during open hours, but delivery trucks--driven by people--come after closing and deliver food for the next day that is unloaded and restocked by people--people who are ready for their shifts to end so they can go home to their personal lives. This last Black Friday, everybody shopped, trashed aisles, and stood in long lines for checkout that were controlled by employees who probably would rather be sleeping, but have expenses their jobs need to pay for. The traffic that we faced trying to get places this holiday were filled--from bumper to bumper--with mere people. The Trader Joe's employee behind the car of a business owner, behind the car of someone who just lost his job, behind the car of a woman in labor trying to get to the hospital, behind the bus of dozens with individual stories, grievances, and joys. My point is that large businesses and small businesses are separated only by sophisticated marketing techniques dependent on keeping the buying and selling process impersonal, because this keeps the focus on the product and the buyer's need for the product. It plays on human self-centeredness to encourage people to spend money on themselves. It's a brilliantly successful strategy that has tricked buyers into believing that the needs that their purchases are meeting are being met by money, and not people earning this money. Do you see my point? Big businesses are like plastic to buyers. They're just businesses, as if businesses can run themselves. They maintain professional, impersonal, robotic brands that have tricked us all, and they've given us small businesses the false impression that we must maintain the same plastic branding to get the same official stamp of realness. To feel that we have grown from a "small business" to a "large business" from more than just the brackets on our tax paperwork. The difference between general blog posts and personal diary excerpts is that the blog posts have to have a point. This doesn't really, although that doesn't prevent it from having meaning to me. Having been trained in marketing, I understand the branding and marketing process to a far enough extent that I shouldn't have been fooled for so long about this--that the authenticity of a business isn't dictated by my ability to be impersonal while working. It is personal. Yesterday my client texted me asking if I would help her order a product on Amazon ASAP and I told her I would have to do it after I finished Black Friday shopping. I ended up working on and completing the task between stores on my phone. My client said she totally understood, and I was happy to help her the moment I could--but I felt that the situation forced both of us to acknowledge the nature of my job, and how all over the place it can make my life sometimes. Don't get me wrong, I absolutely love my job, and I chose it specifically because I enjoy connecting personally with people that I work for, and I enjoy working during unusual business hours as the behind-the-scenes orchestrator of weddings. My job is perfect for me, and I gladly let it consume the majority of my time. What I have realized and decided, however, is that the nature of my job as a business owner requires not that I make my brand another, plastic corporate operation, but that I keep it manageable as a lifestyle. And given that the bulk of my work as a wedding planner includes clear communication, healthy and compassionate relationships, delegation skills, and teamwork, I would argue that keeping things honest and relational is absolutely necessary. Is that really so unprofessional and bad? I think that clients WANT to hire a wedding planner that they can connect with. They're going to share with me--over the course of the months, sometimes years, that we work together--personal concerns and aspects of their lives that they will desire and need me to respond with empathy, relatability and humor to. They need responses like, "I love that idea! That sounds like so much fun! ", "I understand that feeling, I've felt that at X time in my life too. It's totally normal, don't worry. ", and "It's okay that you're fifteen minutes late! I know how stressful life can get." This works for me. I find, to my utter joy, that my clients will extend the same grace to me as well, like when my client yesterday understood that I was Black Friday shopping, and told me to have a great time. The relationships I build with my clients become ones of mutual respect, patience, and honest enjoyment. The client I spoke with yesterday is a wonderful woman getting married next week, and we are both sharing in the excitement of it together. It's not just a job to coordinate her wedding for me, but a personal investment, because I WANT her wedding to be beautiful and perfect. I bought her and her fiance a wedding gift, and I feel sad that in a week we will be done working together trying to find deals on centerpiece flowers and backdrop curtains. Wedding coordinator to bride, she is my client, and I am professional. But woman to woman...I kind of want to go to coffee with her sometime. Will I ever? I'm not sure, but it makes me happy knowing I have these kinds of relationships with people that I work with on a regular basis. I know I'm very lucky to have such a pleasant working environment. I love my job. I LOVE my job. Here's to staying personal and keeping the hustle real.